This suspension information is generally accepted for all Husaberg motorcycles. Most riders want a motorcycle that will turn on a dime, yet be very stable, it should feel like a 125cc to flick around and not tire the rider out, right? Well, as usual, we have to compromise, but at least we can try and get as close as possible. With all the pre 2004 Husaberg motorcycles, anything that steepens the head angle is generally good for the bike. You’ve all seen how unstable the steering can get on a bicycle or speedway bike, while a chopper is the antithesis of stability. Therefore, we need that speedway steep head angle. Unfortunately, our suspension is linked to the handling issue. If we fit a very strong rear spring it will jack the rear and the front end will become ‘speedway-ish’ or if we fit stronger front springs instead the bike will have a kicked out front like a Harley and we’ll never get around that tree nice ‘n tight! So all along you should be tweaking the knobs on your suspension and trying to get a comfortable ride or a fast ride for racing. But let’s say we have the correct suspension ‘weight of spring’ and so we’re just doing the HANDLING here. We can set the handling and then work out what it will do to the suspension and it’s up to you then to decide how to (or do nothing) correct the suspension so as to keep the same ride heights etc. To lower or raise the front we simply either slip the forks up through the clamps or down. This test is worth doing but remember that the more the forks sink in their travel – the more they sink still more! because wieght starts to “pour” over the front the more it goes down. Therefore sometimes we only need a small change to create this ‘tipping point’. On the rear, we will change the suspension when we raise or lower the bike. This is done by turning the preload ring about 1/2-a-turn either way. The first thing you should try is the tightest turn you can – say around a barrel. With a kicked out front the bike may be very slow to turn around and you may even lose the front end as a result. Typically by jacking the rear 1/2-a-turn: you’ll like the new turning speed but alter suspension too. 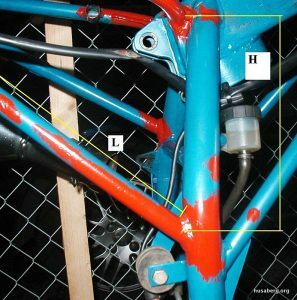 The answer will be to put back to ‘as was’ but this time make you’re change at the forks as described above so if you liked the jacked rear you need to raise the clamps on the forks to keep the bike at the same level. Remember that changing things at the forks doesn’t alter the suspension but at the rear it does so change the front if you can! You can do this until you start to find that the bike is too temperamental for you – it’s your choice when to stop. Headshakes over stutter bumps or under braking = too much rebound on the forks results in the front end staying too low and the head angle is now too steep! Bike does a sink and rise, sink and rise at the rear under hard acceleration, or at speed on a fast corner = rear spring is too soft. Use more pre-load as a get out of jail OR get a stronger one. If the forks always seem to sit too high even though all is good (you feel like a little boy looking over the bars) you need more float in the MV of your forks. This makes them ride lower. Also see below for drilling the BV piston. Putting the bars in their forward position and also with no raisers are the two ways that ADD weight to the front – and vice-versa right? Check out the superb documents we have in the Front Suspension and Rear Suspension sections on the where’s and why’s of all this. What’s the order I should do all the work in? The simple answer is “whatever the bike needs next!”. For me on my FE400e, I set all the sags, set them again and then try different springs and valving. At the same time (‘PITCH’ changes) the preload was changed on the rear and the forks moved up and down in the clamps at the front. All testing should be done back-to-back and on the same day where possible. Something to think about is the fact that loosening everything off on the shock will mean the exhaust being dented heavily by the caliper. Any frame lowering should be done after you’ve checked that a strong enough spring is fitted. So although there is no particular order, there are some things we can bear in mind! 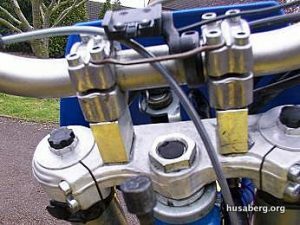 Standard clamps on 99% of Husaberg motorcycles are the 22mm, they make it harder to drop into a corner but make the steering not so ‘twitchy’ when held over. The Husaberg frame is so strong and well made that instead of trouble with headshake in a straight line with 22mm, the Husaberg is rock solid! 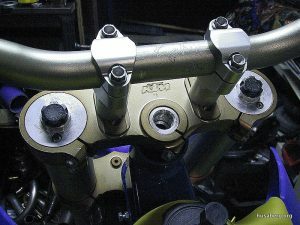 Many KTM clamps are 20mm. The mod is to go down to 20, 18, 16 or even 14mm – all to be found on various KTM motorcycles. The front end on the pre 2003’s is so kicked out that this mod has no vices-just virtues! This mod brings the front wheel further under the front of the bike by the amount the offset is shortened by. This adds weight to the front and will therefore compress the forks further on corners and braking etc. If it is done in conjunction with raising the legs through the clamps, the result is a lower centre of gravity and a bike that flicks very easily from left to right. So if the first change alone doesn’t help, the pair will! 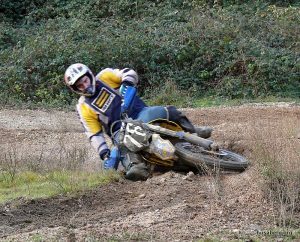 However the steering over reacts and you’ll find yourself riding under and over berms with the throttle on ‘a little’ then ‘off a little’! 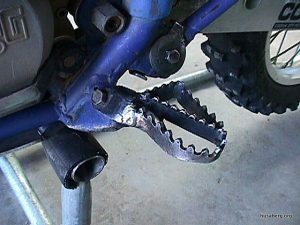 Husaberg fitted 17mm clamps to their SM’s from around 2005, and from 2007, all SM’s were fitted with adjustable offset clamps (16-18mm). Taffy found that the bike wouldn’t drop into corners with the 22mm, and 18mm made the bike weave due to too much steering. 20mm are the best choice. Forks have been dropped through by 15mm and the bike grips going into corners better. But was this a suspension problem or a handling problem? Fitment and feel. Further to this though, all the above bearings and spacer are now fitted as OEM items and can be bought straight out of the Husaberg parts book. If you’re long in the leg or an expert class rider then well worth it, they also save energy due to less effort to stand. But they make the balancing of the bike more difficult for corner entry, etc. and finally, remember that the bike will ‘pitch’ more too and from. I even added another 1″ to the taller seat and this flatter top allows excellent movement back and forth as well as allowing the rider to get his leg between the bars and the top of the tank. It uses a lot less energy. A very good racing investment! This shortens the wheelbase favorably for all pre-2004 models. Watch for the tire rubbing on the inner lower guard as the first problem. This can be cured with a 1/2″ wide metal strip that helps reduce the sharp curve and “flattens out” the inner guard. This idea though, isn’t such a good idea on the 2004+ models because with the steepened head angle, the wheelbase is already short. Indeed many riders report that having the rear wheel further back is better! A British magazine (TBM) did a test on seven sets of tires in typical English muddy weather. The two cheapest tires came out on top, with the Dunlop 956/909 winning and the Maxxis coming in second. In the UK, for regular tubes 12-15lb will suffice at all times. If fitting heavy duty tubes the pressures can drop right down for any wet terrain. I run 6lb front and 9lb rear in very wet mud. 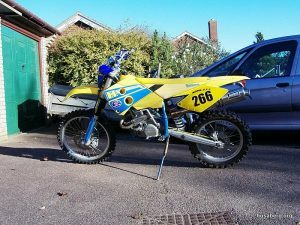 This has been known as the Husaberg achilles heel for many years and neither the factory nor the aftermarket companies have done anything about it. Along with the raised bars and the tall seat, you can try to narrow the tank using a heat gun. First, stick the tank on the exhaust tailpipe of the car for 10 minutes (with the taps open) this will fill it with inert gas and we’ll all feel happier. There is no danger now of impending doom ok? Then lay the tank on it’s inner face on a bench edge etc., and use a heat gun. Press the flank down with a broad piece of wood, clamp down and then heat again…. the tank will fold in slightly, and capacity will drop to 8 liters (from 9). It makes a nice difference and saves money. 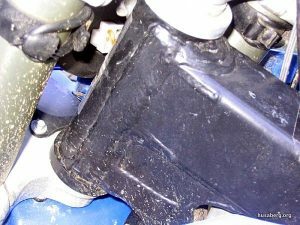 The radiator then becomes the widest part so the tank is just masking the next culprit! The 2001-2003 Husaberg motorcycles have the same frame with the kicked out front wheel. The bike is extremely stable and great for flat out stuff. From 2004-2008, the front end was 1.5 degrees steeper and the front wheels would touch the header pipes under braking ’til these were modified by the factory. So this brought the front wheel 1.5″ (38-40mm) nearer the rear wheel. The front end feels more planted and the bike is quicker to turn. However the wheelbase is now very short and can be less stable under extreme hard braking and downhills etc. The balance has gone from the bike though. If you want balance back to front you have to bring the rear wheel in, bring the rear wheel in and the wheelbase is too short. Add to this the fact that 18-20mm TC’s appear to make the bike turn better – loading even more on the front – and you can see why the factory lengthened the steering head! This then allows the rear wheel BACK to keep the balance. The wheelbase of the 2004-2008 is fine at 1490mm, when most are 1475 to 1490 (the WRs are 1500) but with the bike being front heavy forcing the rear wheel forwards (for balance) plus the shorter 17-20mm TC’s at the front putting even more weight on the front means that to get balance the wheelbase comes down to 1455-1460. This is VERY short. 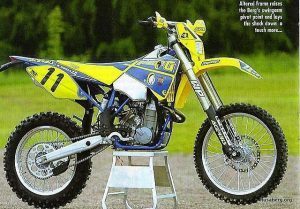 A look at the factory bike in this photo reveals a large gap between the bottom of the engine and the frame rails. It appears that the engine has been picked up at the front. Why? If these three are in line the torsion under acceleration is stable. If the rear wheel is lower RELATIVE TO THE FRAME then the rear wheel is driven into the ground under acceleration but also sinks up under the seat when decelerating, this sounds good but instead totally destabilizes the motorcycle. Soft suspension and the rear wheel spindle being above this line means the opposite. With factory riders wanting such hard suspension the three axis are well out. So to counteract this the engine was raised and also the rear engine dowels may have been eccentrically machined to again try and bring these three axis into line. Both Taffy and Mikst have done this. How To Guide by Taffy: the top tubes were cut at the front pivot and re-welded whilst the lower diagonal arms had about 9mm removed and were then re-welded. This lowered the frame in the area over the tire by 50mm (2″). Luckily the tailpipe is on a slipping clamp, the inner mudguard had the heat gun treatment and some spacers fitted w/ longer bolts so everything has bolted up professionally! I now only use one exhaust spring. The only real mod was to remove the seat cover and guts and then to cut the seat pan open, flatten out the pan and with a sheet of metal i riveted the pan together again. It looks like an eye from underneath. The seat was then recovered.